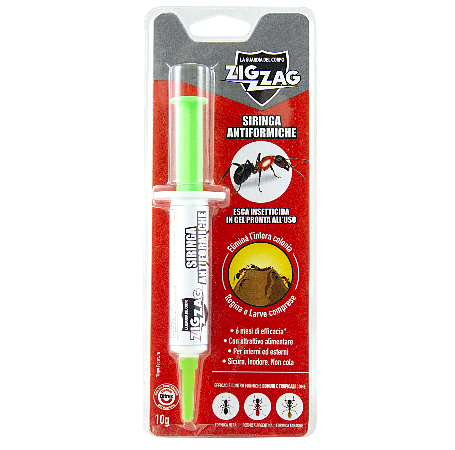 Zig Zag Syringe Anti ant is an insecticide in gel formulation effective against common and tropical ants, among which the Black Ant (Lasius Niger), Argentine Ant (Linepithema humile) and Pharaoh Ant (Monomorium pharaonis). The product can be used indoors (private homes and / or public buildings, residential, commercial, industrial) and around buildings (perimeter of buildings, terraces and private gardens). The product can be applied using syringes for the control of the three species of ants mentioned above. For the control of the Argentine ant, the product can be placed inside priming stations. Zig Zag Syringe Anti ant can lead to the eradication of the entire colony: its delayed effect, which occurs after a few hours from ingestion, allows the worker ants to transfer the product to the other individuals in the nest, including queens and larvae, through the particular phenomenon called Trophallaxis, which involves sharing food between individuals of the same colony. The area to be treated must be carefully inspected to determine the extent of the infestation. Remove from the neighboring areas any alternative food sources accessible by ants. For outdoor use (terraces, patios, courtyards or gardens), the product must be applied in places of greater presence: gutters, cornices, and at the entry points of cables and pipes. Zig Zag Syringe Anti Ants should be placed in small drops or alternatively forming thin lines near the nests or paths traced by the ants. Press the tip vigorously to remove the cap. Dispense the gel forming a short line of about 3 cm near the ants. Close the syringe with the cap for other applications (the product remains effective for the following 6 months). The product can be used indoors (private homes and / or public buildings, residential, commercial, industrial) and around buildings (perimeter of buildings, terraces and private gardens). Its delayed effect, which occurs after a few hours from ingestion, allows the worker ants to transfer the product to the other individuals in the nest, including queens and larvae, through the particular phenomenon called Trophallaxis, which involves sharing food between individuals of the same colony.